That sweet beachfront property must have cost an arm and two legs! Minute 33: Ben takes Luke home and tells him about his father. A lot of the conversation in this minute is built on in the prequels (e.g. Jedi knights, space freighters, The Clone Wars). Ben's comments in this minute about Uncle Owen wanting Luke's father to stay on the farm and not get involved do not align with what actually happens in the prequels. Lots of good 'Star Wars' stuff in this minute. Ben appears to be telling Luke rehearsed lies (at best) about his father. From Pete: Ben's house in the movie is an actual house in the real world. It's like a small shed off the side of a Mosque and actually faces The Mediterranean right on the beach. Did Ben buy his house, or maybe use The Force to make it out of stone? Is The Force like the Green Lantern ring, or telekinesis? If Ben didn't make his house then where did it come from? This is the minute whereby PTR posits his, now famous, theory that The Force doesn't actually exist and is just a powerful state of mind. Does Ben have a job / money etc? What does he eat? Highlights of this minute include a torso camera wipe as C-3PO stands up, and the physicality of Anthony Daniels' acting (which is always good - e.g. little head moves). Alex wonders if Anthony Daniels is actually in the C-3PO suit at the beginning of this minute - i.e. still in the desert - or if Mark Hamill is controlling the head with a rod off camera. This theory is generally discounted by Gaz (and Pete and Alex ultimately agree with Gaz). The idea of The Clone Wars in this minute sounds better than having it explained at length in newer movies and series. Jedis, Jedi knights and how well known they are throughout the 'Star Wars' universe. Gaz explains how he interpreted Ben and Luke's father's relationship as a child. Did George Lucas know, at this point, that Darth Vader is Luke's father? Ben's house, how it looks and how everything works. Also, what is the panel on the wall for? Is it a 'Star Wars universe version of Big Mouth Billy Bass' or a telephone? Biff from 'Back to the Future' and Cantina Band references. Ben seems to know a lot about Luke in this minute and Luke seems to take it quite well. Wouldn't he be surprised? General conclusion from this minute - Luke is really easy going and doesn't really understand what is going on a lot of the time. The decoration on the box that holds the Lightsaber looks like a sword. Is the box therefore Ben's sword box? Referenced: From Dune - "...navigator on a spice freighter". 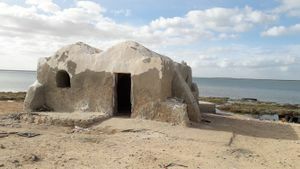 Old Ben's house still exists, and it's located at 33°44'27.0"N 10°44'05.8"E which is in Tunisia. Gaz: And it's me Gaz from Old Man Hair Warehouse. Alex: And it ends with Obi-Wan Kenobi in his house and he's getting Luke's Lightsaber out. Gaz: Wait, what? Gaz: To Pete "So telepathy to you is less mystical than telekinesis and that's why you choose to believe that?" Pete: <long pause> "Yes" Gaz: "Ok. You're a complicated man, Sir." Alex: To Pete "So you're saying in the end when he uses The Force to blow-up the Death Star that was more about sort of..." Gaz: "Convincing the Death Star to blow-up!" Alex: Maybe its like a telephone or something. Maybe...he calls Yoda. Gaz: He's a hermit; he's not calling anybody. This page was last modified on 26 February 2019, at 21:15.